From September 7 to January 27, 2018, Galerie m Bochum is showing a series of early photographs by Simone Nieweg (b. 1962). Gardens, fields, forests, and meadows have been favorite motifs of the artist’s since 1986. 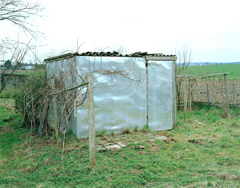 Her third solo exhibition at Galerie m now features fourteen photographs made between 1986 and 2004 in which Nieweg focuses her lens on garden huts, sheds, and other constructions. She seeks out her motifs on long forays and treks through gardens and fields, often on her home ground in the German state of North Rhine-Westphalia. 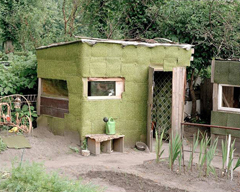 The photos on view in “Early Garden Sheds” were produced near Düsseldorf but also in other parts of Germany, including Mecklenburg-Western Pomerania and Saarland. The images highlight how the unconventional makeshift buildings sometimes stand out from their natural setting but in other cases seem to be inextricably entangled with it. Bearing the marks of wind and weather and shaped by continual additions and reconstruction by human hands, the sheds conjoin artificiality and rugged industrial materials with natural, organic structures. Looking at the way they are constructed and the layout of the gardens it is evident that these are carefully planned and lovingly designed places. Such painstaking planning stands in most cases in sharp contrast to the pragmatism manifested in the motley materials from which the sheds are crafted. Some of these elements have been repurposed from other parts of life, for example the workplace. The photographs derive their appeal precisely from this clash between manicured gardens on the one hand and cobbled-together structures on the other. 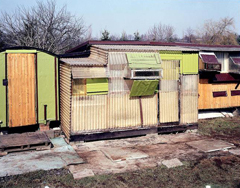 Although the garden sheds shown here are from an early phase in Simone Nieweg’s career, the theme still remains pertinent for the photographer today. She has noticed that such garden structures are gradually disappearing from the landscape and has therefore set out in search of those that remain in order to preserve them for posterity in her photographs.